One of the most important magnetek ballast parameters for the lighting designer/engineer is the ballast factor. The ballast factor is needed to determine the light output for a particular lamp-ballast system. Ballast factor is a measure of the actual lumen output for a specific lamp-ballast system relative to the rated lumen output measured with a reference ballast under ANSI test conditions (open air at 25 degrees C [77 degrees F]). An ANSI ballast for standard 40-watt F40T12 lamps requires a ballast factor of 0.95; the same ballast has a ballast factor of 0.87 for 34-watt energy saving F40T12 lamps. However, many ballasts are available with either high (conforming to the ANSI specifications) or low ballast factors (70 to 75??). It is important to note that the ballast factor value is not simply a characteristic of the ballast, but of the lamp-ballast system. Ballasts that can operate more than one type of lamp (e.g., the 40-watt F40 ballast can operate either 40-watt F40T12, 34-watt F40T12, or 40-watt F40T10 lamps) will generally have a different HID ballast factor for each combination (e.g., 95%, <95%, and >95%, respectively). A magnetek ballast in an HID system has generally two functions: 1) to provide voltage to the lamp so that it can initiate and sustain the arc, and 2) to provide the proper current to the lamp once the arc is started. Metal Halide lamps cannot be run directly off of 120 VAC like an incandescent lamp, because up to several thousand volts used to ignite the arc may be needed. The current must also be limited so that the lamp does not draw so much current that it destroys itself. 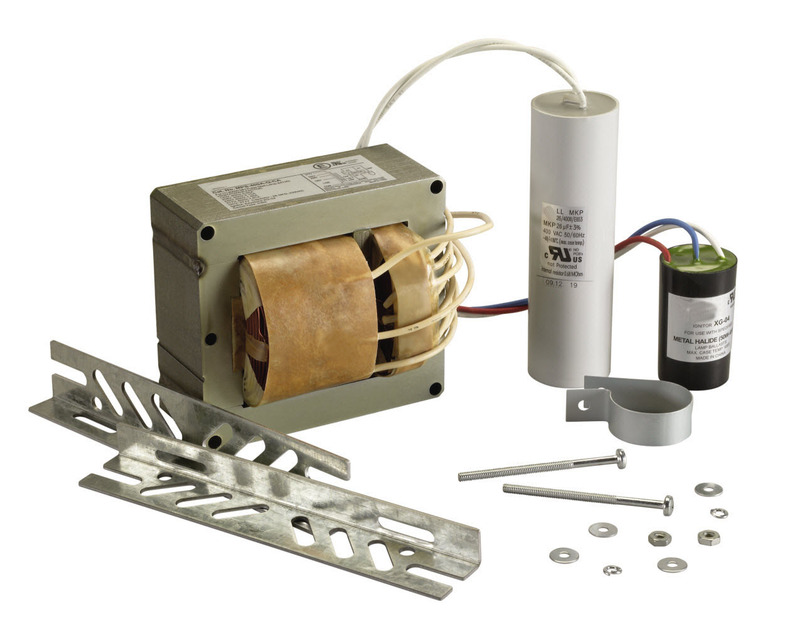 Ballasts are typically of a Core & Coil, F-Can or electronic design. The Core & Coil is a transformer without a case along with a capacitor and igniter, if necessary. This can be a very economical choice, but it requires more wiring expertise and a metal box to house all of the components. This type of ballast will come as a kit with the coil, capacitor and igniter, if necessary. The F-Can and electronic ballast have all of these components in a pre-sealed rectangular metal box. The F-Can ballast looks just like a fluorescent lamp ballast, and it may also be called a tar ballast because of the tar-like material the can is filled with. The main problem with an F-Can ballast is that if one component such as the capacitor fails, you have to replace the entire ballast. A Core & Coil setup has a separate capacitor and igniter, so they can be replaced individually if one of them fails. The capacitor is the most likely component to fail.